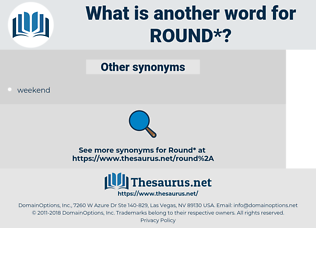 What is another word for round? A walk performed by a guard or an officer round the rampart of a garrison, or among sentinels, to see that the sentinels are faithful and all things safe; also, the guard or officer, with his attendants, who performs this duty; usually in the plural. enrolments, panellists, ballots, trips, grades, officials, remarks, visits, Miles, hikes. Circled, covered, Went, Allowed, wanted, Got. working, developing, Including, orbiting, circulating, focusing. deceitful, low, tiny, soft, dishonest, incomplete, indirect, unfinished, straight, small, inadequate, weak, lacking. neglect, ruin, destroy, roughen, straighten. Then why can't he come round, if it was ever so little?
" Turn round here till I look at you! 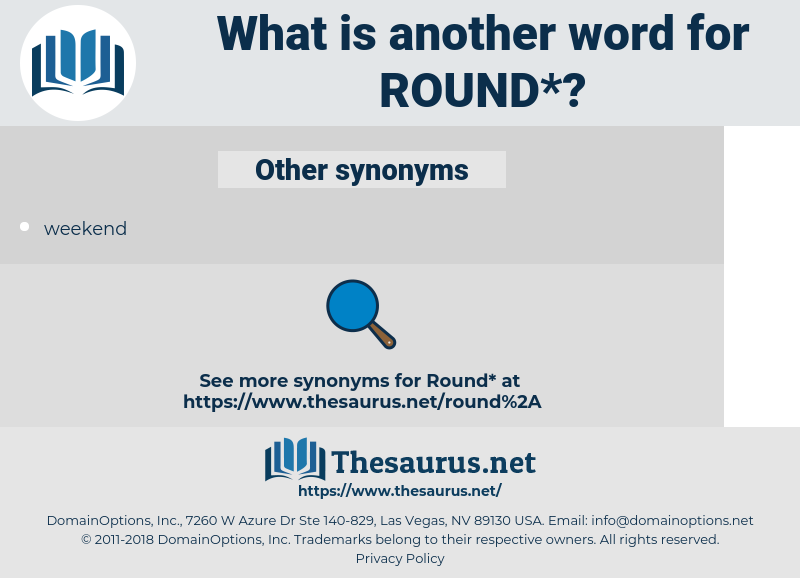 rend, run out, remand, reanimate, ruminantia, runty, rondeau, remediate, remount, remote, raw wound, reanimated, rand, Rheum Emodi, rhymed, run into, remedy, rant, remit, reunite, roomette, rear end, rimed, remuda, rent out, rearmament, renowned, ramate, rounded, rimmed, roommate, ruminate, roundheaded, reorient, rear window, remnant, ruanda, roundhead, rind, rent, rente, reorientate, ranid, rheumatoid, remind, round out, rear-end, rwanda, ruminant, raw meat, randy, ruined, round-eyed, renewed, riant, runt, rondo, ranidae, rain out, rainy day, roman deity, rennet, rain date, raiment.